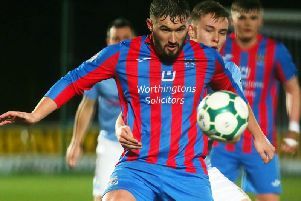 Former Institute and Derry City striker Stephen Parkhouse will get his first taste of football management tonight (Wednesday). Parkhouse has been appointed the new Buncrana Hearts manager and he will be assisted by former Limavady United midfielder Colin Logue. The big striker’s first game in charge of the Donegal men is this evening against Carrowmena in the Charlie O’Donnell Cup, at Maginn Park. Buncrana have been playing under the temporary charge of Gary Duffy since the start of the new Inishowen League campaign. A statement on the Buncrana Hearts Facebook page confirmed the news: “The club are delighted to announce the appointment of Stephen Parkhouse as the clubs new senior manager and Colin Logue as his assistant with immediate effect.